Ever tried this steamed milk custard? It’s so smooth that even tofu fa (a kind of traditional Chinese dessert, aka soy milk custard) can’t beat it. It’s a perfect quick dessert after dinner. The pungent aroma of ginger makes the silky milk custard so wonderful. My family loves its simplicity and silky texture. Ginger is widely used in Chinese herbal medication as it helps our blood circulation and treats indigestion, upset stomach, diarrhea, and nausea. Old ginger is often used in creating confinement dishes in Chinese tradition. When it comes to making this delicious dessert, I often use old ginger, it is suitable for all people in the family though. That's how I grate ginger juice with the white box shown in the top 2nd picture. 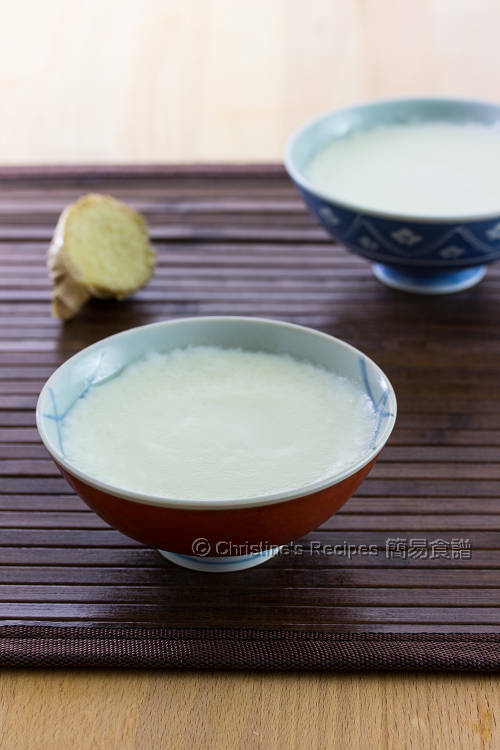 You might have known a classic Chinese dessert, ginger milk curd (薑汁撞奶), that are mainly made by ginger, milk and sugar. However, you’ll be easily disappointed as many things could go wrong along the cooking process as a result that the milk won’t set properly. Egg white is a good and natural coagulator. Armed with this recipe, you’ll be very confident to enjoy a bowl of nice and hot ginger milk custard after dinner, instead of compelling to drink ginger milk because you don’t want to waste anything. Place all the ingredients in a large bowl. Mix well. Try not to beat too hard and avoid from making too many bubbles. Sift through a fine sieve. Transfer the milk mixture into two rice bowls. Cover with aluminium foil. Steam in a wok over medium-high heat for about 10 minutes. Turn off the heat. Don’t remove the wok lid. Let it stay in the wok for 10 minutes. Done. Serve immediately. Covering the bowls with aluminium foil when steaming prevents water from dripping onto the surface of egg whites. Thus it helps produce very smooth custard. You might adjust the amount of ginger juice and sugar to your liking. The eggs I used are 58 grams each (weighted with shell). Christine, I never see anyone steam it for this recipe !! Or yours is with egg white !! No wonder !! It set by the ginger juice and the boiling milk !! Let it set for 5 mins. 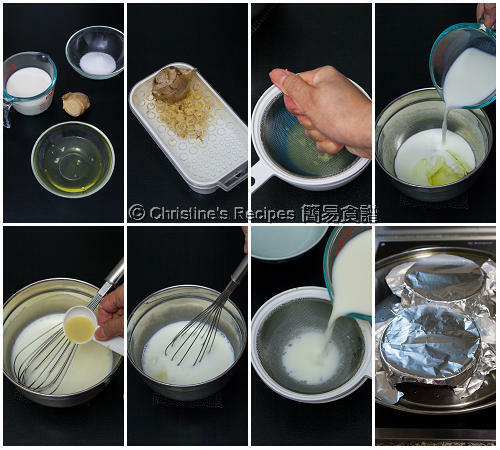 The name is Ginger Hits Milk 薑撞奶http://www.tastehongkong.com/recipes/ginger-milk-pudding-a-natural-custard/ May be you try this recipe. 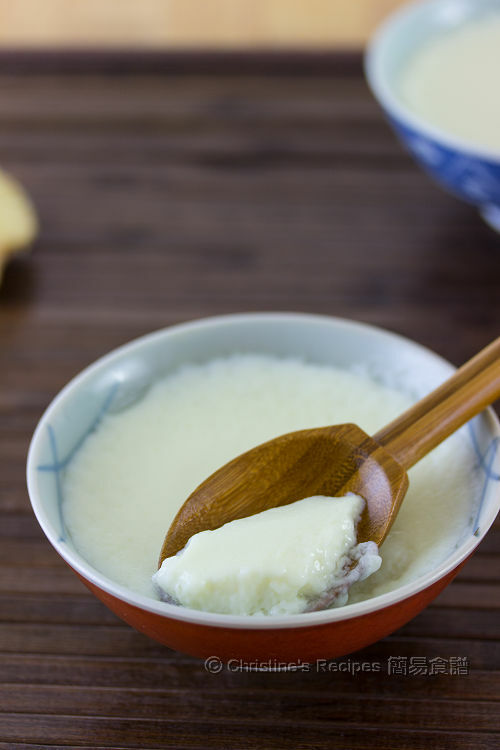 Speaking of ginger milk curd (薑汁撞奶), one of my favourite Chinese desserts, I often make it for my family. And I also posted the recipe on my Chinese food blog here, back in 2008. Unfortunately, I never managed to translate it into English and share it on this blog. My bad. Your feedback gets me thinking of adding one more paragraph to explain why I added egg whites on this post. Thanks so much for your comment anyway. Sure, this recipe should work for rice milk, soy milk or any milk you like. The egg whites will do the job nicely. How do you make the ginger juice? I squeezed out the juice from the grated ginger with my clean hand. See the white box shown in the picture above. That's the gadget does the magic. Such a good dessert , & my daughter loves it ! thanks for your lovely recipe. i tried yesterday using soya milk instead and omitted the sugar. but it does not set after the 10 + 10 mins to be like custard texture. but nevermind, it became a slightly thicken ginger milk which is so soothing and calming... going to make this again for my other family members. Thank you! Hmmm...what size of eggs did you use? Might try adding one more egg white next time and see how it goes. This recipe looks lovely, do you think I could use two whole eggs? Sure, you could use whole eggs. But it won't look white if you don't mind. The egg weight is with shell or without shell? Thanks. The egg weight, mentioned in the section of "notes', is with shell (the whole egg). nice recipe.. But does it smell too 'eggy'? What do you mean by "eggy" ? I, myself, smell the aroma of ginger. Hi, this is really great! I am going to try this with almond milk next time! By the way, this makes me think of making chawanmushi, do you by any chance have a chawanmushi recipe? Cheers! Haven't posted chawanmushi yet. Might make it some time. Thanks for reminding me of this great dish. Hi can use ginger powder instead of ginger juice? Ginger juice can't be replaced by ginger powder. Hi, full cream milk can be used? Sure, you can use full cream milk. If you added water, the taste will be diluted. I just grated ginger with a grater and squeeze out the juice. What does sifting the mixture through a fine sieve do? If I skip this step, how will the pudding be different? It helps remove the foam and the texture will be more smooth. Thank you for sharing this yummy recipe... I happen to eat ' MILK TOFU ' in a restaurant. It comes in square cut size similar to tofu squares and its skin is fried on the outside, while its inside is very soft . May I ask if the inside holds the same recipe content as that of the Milk Custard ? Since it comes in fried squares, when served, it is recommended to be dip in sugar for a more tastier dish. Think that you're talking about deep fried milk. The inside is not made with this recipe actually. Thanks so much for your recipe .... Tried tonight !!!! On my God! It soooooo easy to make and its sooooooo good... Bring back a lot of memories!!!! Thank you!!!! Glad that you loved this recipe. We love this homey dessert too! hey do you think it would be okay to leave out the ginger? because i never really liked the flavour ! Traditionally, this dessert has a bit of ginger juice to add a kick. You may skip it though. Thanks a million for this wonderful recipe. Made 6 bowls with Soy Milk and they turned out deliciously smooth :) am wondering, for how long are we able to store this in the fridge? Thank you :) ps: I really enjoy reading your blog! Wow, 6 bowls of soy milk. Glad that you liked my recipe. They can be kept for up to 5 days in fridge if covered tightly. If I were to put this in a 9X13 glass tray and increased the proportions. Do you think that would work? I want to serve it to a big party and can't do the individual bowls. Sure, you can use any size of tray to made custard. But you need to experiment how long your custard will be just cooked through.